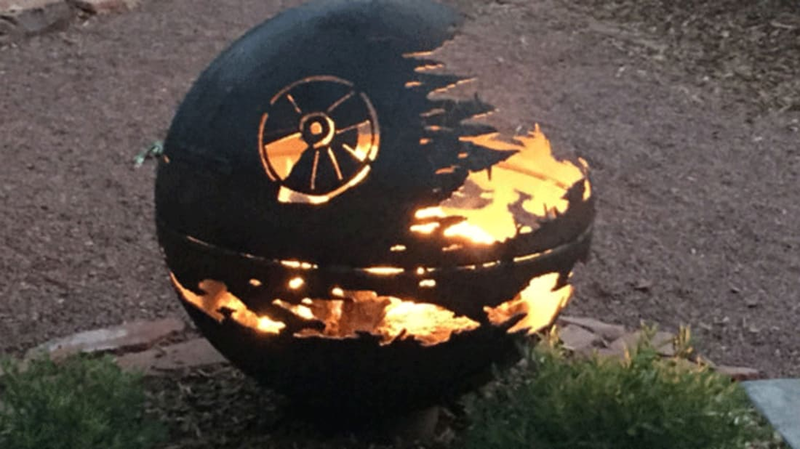 If a smoldering Death Star sounds like the perfect addition to your backyard barbecue, you're in luck. As reported by My Modern Met, Farmington Metal Firepits sells custom-designed pits inspired by Star Wars: Episode IV's (1977) iconic climax. The nerdy piece of metalwork first surfaced on Reddit last year. At that point, it was a one-of-a-kind item that one Redditor's grandfather had welded for her using the end caps of old propane tanks. The Star Wars fans of the Internet were eager to purchase a Death Star fire pit of their own, so the poster's (Bandia5309) grandfather made more and started selling them on Etsy. Each pit is crafted from steel and available in diameters of 30 inches for $1000 and 37.5 inches for $1300. And if you're looking for more options, Farmington Metal Firepits isn't the only company that specializes in Star Wars swag you can set aflame. The UK-based metalworkers Burned by Design manufactures steel burners modeled after R2-D2, Darth Vader, and BB8 (you can check out their full body of work on their Facebook page).